House of Paws Pet Salon located in Greenville, South Carolina, are a full service pet salon with grooming services for your pets.We groom Dogs and cats of all breeds and gladly accept walk-ins when time permits! pet you would like for us to groom (ferret, guinea pig, etc) please call for a consultation. Your pet's bath will include a nail trim, an ear cleaning, a sanitary trim as well as trimming of hair between pawpads and removal of hair in the ear canal if necessary (some breeds don't need this). Your pet will have a bath, and will rest in a kennel with a dryer blowing him dry. A groom includes everything described on the bath page, as well as a haircut. We groom cats too! We will talk with you to determine how you would like your pet's coat trimmed or shaved. Wouldn't you like to leave all of this hair at our house instead of yours? 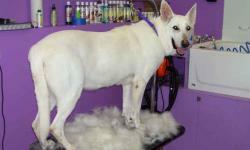 Ask about our shedding solutions. 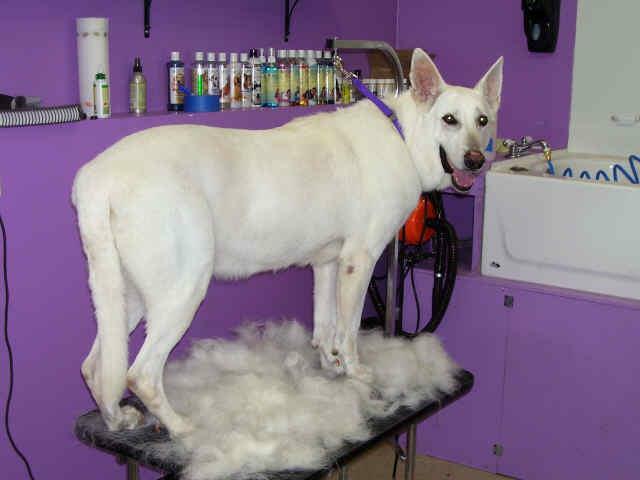 With special tools and techniques we can safely remove hair and undercoat to dramatically reduce shedding!